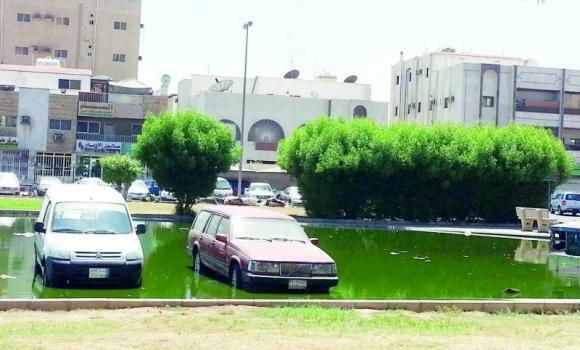 A road in front of popular supermarket Marhaba is filled with dirty water, making it an ideal breeding ground for mosquitoes and all sorts of diseases. While the Ministry of Health continues to battle the spread of the deadly coronavirus, other imminent health threats remain on the loose in the city. In fact, several parts of Jeddah have become breeding grounds for diseases and the municipality does not seem to be doing anything about it. A side street off Prince Majed Street in front of popular supermarket Marhaba, for instance, is filled with dirty water, attracting mosquitoes and all sorts of other diseases. Children in the area have also complained that they can no longer play in their neighborhood and are not allowed to go any further by their parents.